The most romantic day of the year is almost here, and you have every opportunity to make it one to remember. On Thursday, February 14 show your special someone how much they mean to you by taking them out for a special evening at one of Vancouver’s most intimate spots — The Trump Champagne Lounge. The last time you shared a bottle of premium bubbly together was likely a special occasion, and since Valentine’s Day falls under that category, there’s no better time to do it again. 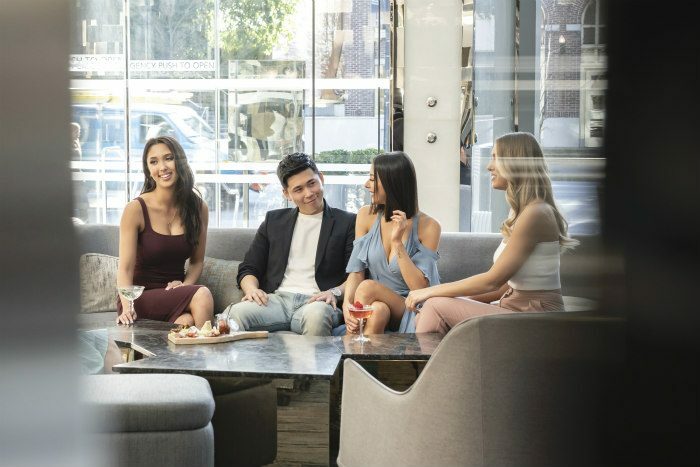 This year, Cupid is in your corner because you can spend the evening at the lounge all within your budget, thanks to amazing happy hour specials. Relax in the social atmosphere with a bottle of La Chapelle ‘Instinct’ Premier Cru Brut for $90 (it’s normally double the price), or Delamotte Rosé NV Brut at $135 (normally $270). Select beers cost just $5, feature cocktails at $7, and select wines at $7 — all until 7 pm, making it the perfect after-work or pre-dinner spot. Start the evening with some delectable happy hour eats like fresh oysters ($9.50), bruschetta ($8.50), or the game-changing gyoza meets Dungeness crab ($9.50). When you’re ready, make the smooth transition to the most Valentine’s Day-perfect desserts you’ll find in Vancouver. Indulge in the very best for the day that’s in it by ordering chocolate fondue for two. 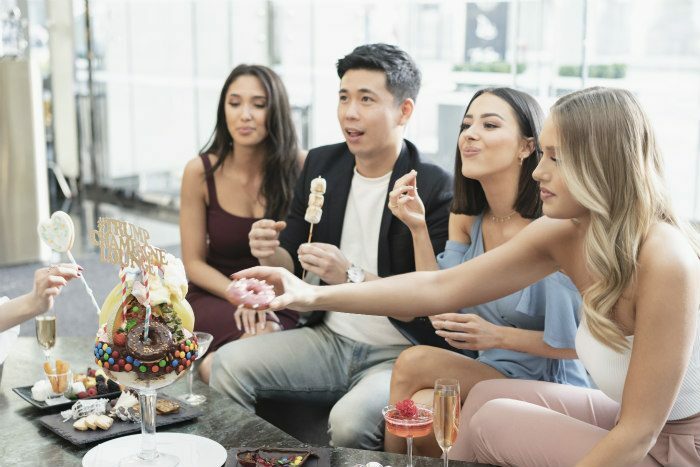 This $60 sweet taste of heaven is made with Valrhona Manjari grand cru 64% chocolate and served with home-made churros, fruits, marshmallows, financier, and potato chips. Planning a friends date for Valentine’s Day? We suggest trying the Trump sundae for four ($120). Picture it now: 24 scoops of vanilla, strawberry, and chocolate ice cream, topped with cereal, whipped cream, fruits, candies, sprinkles, and cotton candy, all drizzled with chocolate. There’s also the creative chocolate charcuterie board that costs just $20 and features chocolate salami served with a cookie and crisp. How often do you eat a dessert inspired by your favourite appetizers? 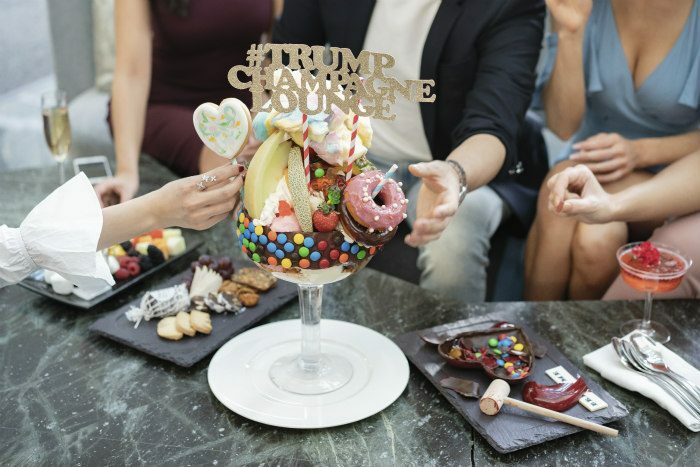 The Trump Champagne Lounge is also serving up an adorable ‘love you to pieces’ dessert that you need to try. This heart-shaped chocolate ($20) is literally made to be broken so you can discover the sweet goodies locked inside. Make sure to Instagram this one before it’s gone (which will be very soon after you break it open).